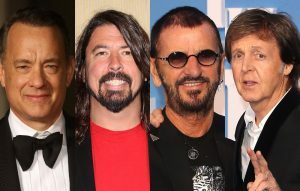 Paul McCartney, Ringo Starr, Tom Hanks and Dave Grohl all went out for dinner together this week, according to reports. TMZ reports that the four stars were spotted at the Giorgio Baldi restaurant in Santa Monica, California on Wednesday night (February 15). The Eagles‘ Joe Walsh also joined them for dinner, while Martin Short and Maya Rudolph were also seen at the same restaurant. See photos below and watch TMZ‘s video of Ringo leaving the restaurant (paparazzi ask him what would happen if Donald Trump “touches” the Queen on his state visit). Meanwhile, Paul McCartney recently shared a rare and previously unreleased demo of his track ‘Twenty Fine Fingers’. The post Paul McCartney, Dave Grohl, Tom Hanks and Ringo Starr all went out for dinner together appeared first on NME.